Home » Gardening » Backyard Nursery Tools of the Trade. Over the winter I spent some time building/inventing a few things that I needed to make the nursery run smoother and my life easier. Some of these are interesting, some are kind of boring, but here they are. Mike’s Legless potting bench now has legs. Originally this was my “Famous Legless Potting Bench” but once I bought a frontend loader it was no longer stable enough to just dump a whole bucket of soil on so I added legs and made it mobile. The simple plans for building the bench are here. It’s one sheet of plywood. So over the winter I broke out the welder and made an axle with two rubber tires that we can slide under the potting bench to easily move it from place to place as needed. You have to watch the movie to see it in action! Homemade garden cart for moving small nursery plants. The next thing that I invented was a little garden cart for hauling around our $4.97 plants. I wanted it to be light weight so I just used 3/4″ plywood, some two by fours then I put metal rods in the corners, welded a washer on top of the rod to keep the chicken wire from slipping up. The chicken wire keeps the plants from bouncing out and it allows us to stack plants two high in the cart. Mike McGroarty’s Heavy Object Mover. This is simple and simply genius if I must say so myself. A piece of plywood, two heavy duty draw hooks and a piece of cable. You have to watch the movie to see how great this thing works for moving heavy objects. I really built it to move my Troybilt tiller around so I don’t have to walk behind it at a snails pace. Now my original plan was to put an axle with two wheels in the front so it wouldn’t dig into the ground. But before I could finish the job I suddenly needed it to move some railroad ties so I figured I’d give it a try without the wheels. Worked perfectly! Those ties slid around like they were on butter. Watch the movie! This is what I was using the railroad ties for. I put them on edge, along the edge of my sunken container area, then laid down black plastic, and placed all of the balled Japanese maples that we have for sale on the plastic and covered the root balls with leaves. The plastic is to keep the roots from the balls from rooting back into the ground. The burlap on the trees is actually a poly burlap so it won’t rot. The trees should be perfectly happy there for as long as it takes to sell them. Come winter we’ll just add more leaves. My last project was to make some Adirondack chairs. I wanted these for inside the Donkey Pen so I made them out of untreated wood since the Donkeys eat most everything they see. But I haven’t put them in the pen yet because I’m not sure how long they’ll hold up to Donkey Shenanigans. Don’t ask for the plans, I didn’t really have any. I just printed out a photo from the Internet and started sawing and screwing pieces together. I pretty much guessed at the curve for the seat and when I put the backs on I only put one bolt in then sat in the chair to get an angle that was comfortable the added the second bolt to hold the backs up. They turned out okay. Not perfect, but okay. Questions or comments post them below. A name for your peace of plywood that you drag your plants around was called a stone boat. Years ago when I worked on my family farm we used wide planks of oak or beach wood and fastened them together with another plank and when a field was plowed you always found a rock or stone that was huge. The stone boat was the thing to use as you just pushed or rolled the rock on the boat and drug it to one end of the field and pushed the object off. Worked well! Sroyce, Stone boat huh? Love it! Hello Mike….from your Nebraska City visitors, Jeannie and Dave. It was a real pleasure meeting you. Thanks for your generosity and taking the time you spent talking to us. I will continue following all your advice…you’ve been a big help to me over the years. Continue the great work….you do inspire! It was great to meet you, wish I had more time to have been a better host. I hope to meet you and Dave again. I have a huge property to start my business on, we have a wood lot, lots of horse manure and raised beds. I am in Ontario, South Western area. How do I get started? I have been gardening for years and it is a passion of mine. Thanks for your time and happy green thumbing! You get started by buying my program and going through the materials. 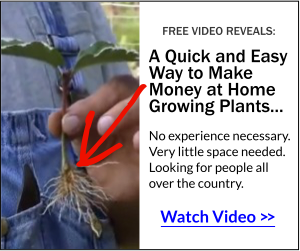 There is no way in the world in a simple blog comment that I can address how to get started growing and selling plants. I’m not trying to sell you, as a matter of fact right now my program isn’t even for sale, but if you look at what it is, two books, reports, dvds and an ecourse. It contains a ton of valuable information. JUST WANT TO THANK YOU SO MUCH. I GET MORE INFORMATION FROM YOU THAN THE PLANT AND TREE BOOKS. I HAVE SENT EMAILS TO EVERYONE I KNOW SO THEY TOO CAN ENJOY YOUR SITE. Thank you Marian, I appreciate your kind words. Most manifolds have either a 3/4 ” or 5/8 in female pipe thread fitting. Go to Home depot and ask for a fitting or better yet …take the valve in and they will help you. How old are the Jap Red Maples in the photo? Most of them I planted about 3 years ago, they were probably two or three years old when I got them. Mike you are amazing. Glenn and I watch your videos all the time and pick up great ideas. Thanks for the inspiration. I love all the tips keep them coming I am having a hard time trying to figure out where to start. I was on the board and didn’t really see a lot for sale am Imissing something? How do you level the bench after you move it. Are the wheels/axle easily removed? The axle just slips in and out. Just tip the bench up, slide axle underneath and pull it out when you get it where you want it.